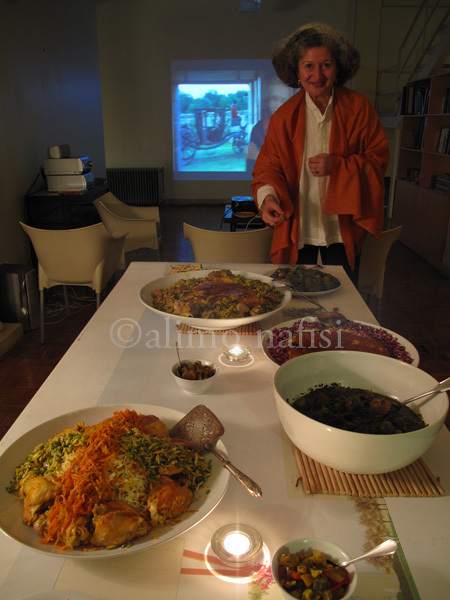 Today is Iranian new year or Nowruz and I am posting the last of my Iranian adventures which was actually the first, a fabulous dinner party at my friend Nasrine‘s house in Tehran cooked by Mariam Khanum, her lovely helper and cook (there is a picture of her cooking with the late Minou Saberi in my Saveur article which is now online; Mariam is the one with a scarf on her head). I was foolish enough on that day to go to the grand bazar instead of spending the day with Mariam in the kitchen but fortunately I went back a few months later, not only to cook with Mariam and Minou but also with a few other wonderful cooks. Here are a few pictures from that first dinner. 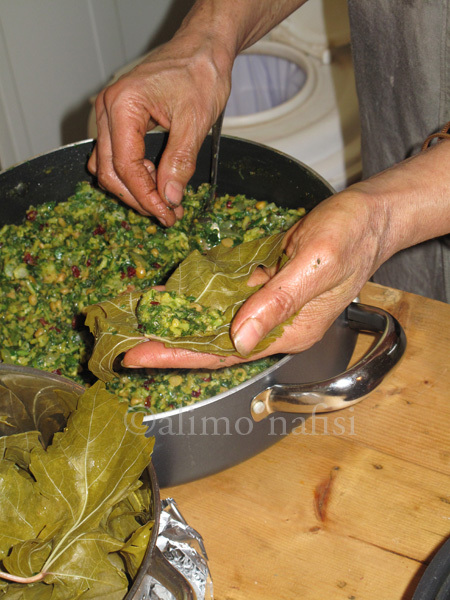 This was definitely the star dish of the evening and luckily I was back in time to watch her stuffing the vine leaves with a mixture of sabzi (mixed herbs & greens) and split peas with barberries (zereshk) and possibly a little rice and meat although I don’t remember. Must check! Mariam cooked the stuffed leaves with unripe green gages (janarek in Arabic and gojeh in Iranian) which were in season — I was there in April. 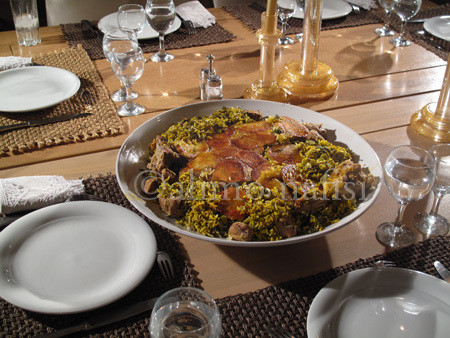 Mariam also made three different rice dishes including jewelled rice, one with sabzi and meat where she used sliced potatoes for the tadigh and a tahchin (baked rice) which she served surrounded with dried rose petals. Gorgeous. 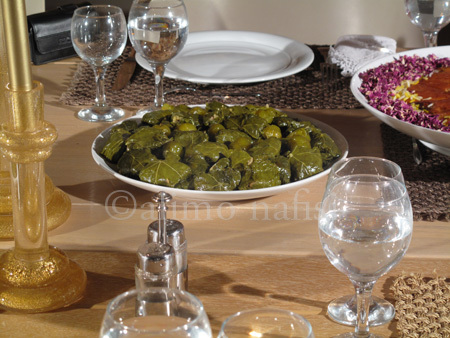 You can glimpse it behind the bowl of ghormeh sabzi in the top picture and next to the cooked vine leaves. Happy Nowruz! Was the rice they used in Iran Basmati? I noticed that the Saveur shirin polo recipe had long grain rice in the ingredient list. Here in Los Angeles Basmati is what the Persians use, but in Israel they sell “Persian rice” at the supermarket, which is different from Basmati rice. Thanks, Anissa. Very interesting. It’s not easy to tell from the bags of rice where it is grown but I will try to find it. There are so many different kinds that it’s possible some of it comes from Iran. My former next-door neighbor was Iranian and she made the most delicious rice. She used Basmati. Maybe some kinds of Basmati are longer grain than others and are similar to the Iranian rice. yesterday night I made one more iteration in my quest for the perfect home made sangak and it helped me to understand that my first guess was probably the best one so far. So, after preparing sangak (sort of), to eat with kabab and sabzi, I finally I prepared toot which I am told are a typical treat for nowruz. 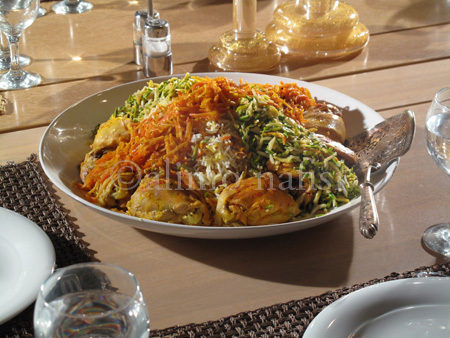 Do you have an email subscription on your blog where we can get your recipes by email? great article,.have heard and read about this fabulous cuisine..so often waxed about lyrically..but every time I have tried it at several ” goof” restaraunts it has been awful..sludge like stews, and yes very separate but very dry dry rice, with way too hard pieces of rice on bottom, , bland heavy egg kookos,, .. i do like their breads and cheese< french feta and of course their rugs,, i believe..one time they even had a salad with eggs and mayo and olives and said uve got to be kidding..then to bring in more customers they add hummos and falafel to their menus..which when properly prepared i love..dont know what to think anymore! thank you, meant to say “good” not goof, but actually that has been the case!! esp with the mayo salad offerings lol…what is it with their restauants?..ive been to a few and have come across the same issues that I wrote about above…seriously why is there such a disconnect about whats written about it and what ive tasted..?